Puerto Vallarta, Jalisco, Mexico - From March 14 to 18 Puerto Vallarta will host the National Stand Up Paddle and Paddle Board Championship and Festival, which will result in the picks for the Mexican national team that will represent the country in international jousts such as the Tokyo 2020 Olympic Games. An invitation was sent out by the Mexican Federation of Surf via the National SUP Organization in order to gather all the paddlers and surfers in Mexico for the first SUP event of the year, and about 80 young athletes from all over the country who hope to be part of the Mexican National SUP & Paddleboard Team are expected to compete. At a press conference, the director of the Municipal Sports Council (COMUDE), José Amador Hernández Madrigal, said that this is the first SUP event of the year and it's an important one, as it will integrate the national team for the World Cup in Brazil and the Pan American Games of Lima, both qualifiers for the Tokyo 2020 Olympic Games, where paddle will be debuting as an Olympic sport. The competition will be headquartered in Puerto Vallarta with a day of competition in Quimixto, Cabo Corrientes, and the winners of the first four places will be contemplated for the selective. The secretary general of the Jalisco Surfing Association, Angelica Estrada, said that since the event is also a festival, everyone is invited to participate as a spectator or competitor. Young athletes are invited to participate in the junior category and an open relay race will be part of the competition. "The goal," he said, "is to promote this sport that can be practiced by people of any age." 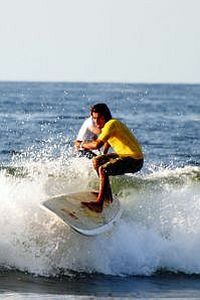 Felix Garcia, the technical director of the Surfing Association, said that Puerto Vallarta is the best scenario for this national meeting, which will be held on Playa Camarones and will also be visible from the Malecón. The Carrera Larga (18 Kilometers relay) will be a two lap circuit that starts at the beach at Uruguay Street and head up to Holi Beach. From there it'll go to Conchas Chinas and back to the starting point for the second lap. There will also be a 200 meter Spring Race in the waters in front of the Malecón. Athletes who have been to the World Cup, as is the case of the Erika Benítez, who has participated in two World Cups and three nationals, and is currently ranked at #1 in the country, #2 in America and #9 in the world, are expected to participate in the festivities, and a young man who lives right here in Puerto Vallarta will represent Jalisco in the competition. Puerto Vallarta Municipal Government press release translated and edited by Ricardo Acerco for BanderasNews.com.